Calling all UUs of the Hastings and White Plains congregations! The corruption of our democracy calls for our attention. The need for securing truly democratic process is clear. Delegates at the 2016 General Assembly in Columbus, OH, selected "The Corruption of Our Democracy" to be the 2016-2020 Congregational Study/Action Issue (CSAI) of the Unitarian Universalist Association (UUA) of Congregations. Every two years, at General Assembly, the delegates select one issue for Congregational Study and Action for the following four years. (Thus, we are always in the first two years of one issue, and in the last two years of another issue). Delegates at GA 2016 considered other nominated topics, "Climate Change and Environmental Justice," "A National Conversation On Race," and "Ending Gun Violence in America." Feeling that these important issues could not be effectively addressed unless our nation's democratic process began working, delegates chose democracy as the single most important issue for UUs to begin addressing. The Congregational Study/Action Issue (CSAI) is an invitation for congregations and districts to take a topic of concern and engage it, reflect on it, learn about it, respond to it, comment on it take action -- each in their own way. A CSAI is NOT a statement -- it is a question. What Does Improved Democracy Have To Do With Unitarian Universalism? Our Seven Principles give us spiritual grounding to put our faith into action. Our fifth principle declares our commitment to "the right of conscience and the use of democratic process in our congregations and in society at large." Our General Assembly considered CSAI proposals in 2010 and 2014 on “Revitalizing Democracy” and passed AIWs (Actions of Immediate Witness) in 2011 and 2013 on amending the constitution. What Are Some of the Questions for Study? Unitarian Universalists have identified escalating inequality, racial justice, voting rights, immigration, reproductive justice, marriage equality and more as major moral concerns. Now climate change looms large. Could passing an amendment establishing that only human beings, not corporations, unions and other artificial entities, have constitutional rights, and money is not free speech, benefit these important issues? What does “corporate personhood” mean and why is it important to address that in addition to “money as speech” in a proposed constitutional amendment? How have Supreme Court decisions over the past two hundred years created this “legal fiction”? How does treating corporations and other artificial entities as persons violate our Unitarian Universalist principles? Is a moral political revolution needed to address voting rights, gerrymandering, voting methods, and the possibility of public financing of campaigns? What Suggestions for Actions Does our Unitarian Universalist Association Offer? Hold forums in your congregation on the various proposals to overturn Citizens United v. FEC and other Supreme Court decisions giving moneyed interests sway in this country. Show the 30-minute film “Legalize Democracy” and discuss how this supports our Seven Principles and affects all ages. Encourage your congregation to pass a resolution for Move to Amend and endorse it. Encourage your City Council and County Commission to pass a resolution for Move to Amend, and work to place a ballot initiative or non-binding referendum on your city or county ballot, so all voters can speak out on this important issue. Invite youth to participate in this effort. Educate your congregation about the Interfaith Caucus of Move to Amend. Use the issue of climate change to reach out to other faiths. Join your UU State Action Network, or start one if your state does not yet have one, and encourage them to include climate change as a core issue and the amendment movement to help address it. What Are the Hastings and White Plains Congregations Doing? Let's begin our plunge into the spirit work of restoring/creating democracy by looking at Parker Palmer's wonderful and insightful book, Healing the Heart of Democracy: The Courage to Create a Politics Worthy of the Human Spirit. 7:30pm at Community Unitarian Universalist Congregation at White Plains. 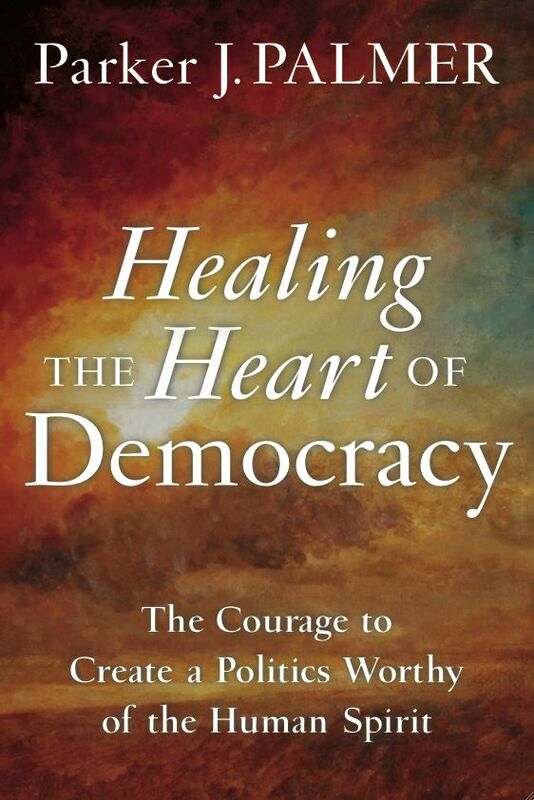 "He bravely takes on the current political climate, and this book provides therapy for the American body politic. His insights are heart-deep: America gains by living with tension and differences; we can help reclaim public life by actions as simple as walking down the street instead of driving. Hope's hardly cheap, but history is made up of what Palmer calls 'a million invisible acts of courage and the incremental gains that came with them.' This beautifully written book deserves a wide audience that will benefit from discussing it."